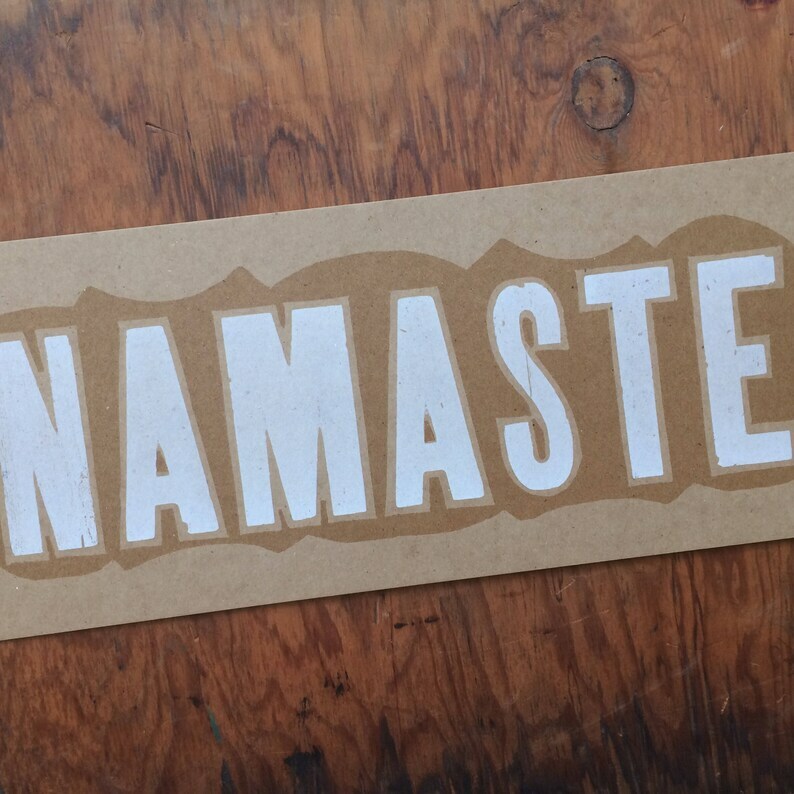 This sign has "NAMASTE" hand printed from an antique gothic wood type font and a decorative woodcut shape surrounding it. Frame, stick it up on your fridge or give as a gift. Printed in white and transparent ink on 100% post-consumer recycled paper... Good for you and good for the environment. I accept PayPal & all credit cards + Etsy gift certificates via PioneerHouse.Etsy.com If you have any trouble ordering please convo me. All purchases are final, I do allow limited exchanges with prior approval. (see shipping info for protection en route to you as damages do happen). Please let me know if you are not satisfied with your purchase for any reason and I will evaluate per situation - I want you to love what you order. All vintage clothing and accessories as final sales. Shipping insurance is recommended as no one is perfect & sometimes packages get run over by a truck on their way to you - no kidding, please ask me if you want your package insured. If you get an incorrect order or if you receive a damaged package you must tell me within 1 week of receipt so I can correct the situation. After that it is considered a final sale. Please supply a secure location for delivery of your order, I do not ship packages that require a signature for delivery as that most often causes more problems than not - if you need a signature confirmation of delivery please request it in advance, it does cost extra. If your package was priority mail & marked as delivered by USPS & stolen off of your porch the insurance will be denied so please make sure your delivery address is secure - consider shipping to a business address. I make & sell many types of handmade wares - some ship in a tube, stayflat, box, cardboard flat or padded envelope, I primarily use new packaging materials to ensure safe delivery. I know shipping costs are ridonkulous but please understand for limited edition work it's worth paying a bit more to make sure it arrives safely. If you have a concern about how your order will ship please convo me before ordering. If your shipping payment is less than it actually costs me to ship it to your location it will go a more economical method that matches your payment. How it ships depends on your location & what you order. Shipping is not just the cost of a stamp - please keep that in mind. I use the shipping address listed in your PP payment. If this is a gift please let me know so I can ship it to the correct location. I normally ship 2 or more times each week so it's possible your order may ship the same day I receive it, if you have a situation that needs immediate attention after you place your order & before it ships please let me know via convo. You can check to see if your item has shipped in "Your Etsy >> Purchases." I click "shipped" when it is packed - it normally goes out that day - but if it's a weekend it may not ship until the following Monday. I do not know if you do not receive your item unless you tell me & the post office is not 100% reliable - nor is any shipping method, please let me know if you don't receive your order. 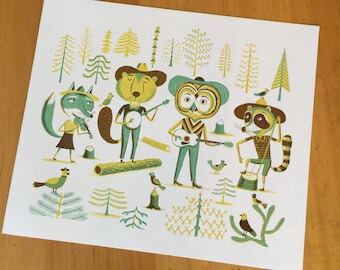 If you order a single or a few prints they ship in a tube which is the safest way to transport them without damage, simply unroll and lay flat prints upside down when they arrive, you can also gently roll the print the other way. I only ship flat for orders of 10 or more poster sized prints & there may be an additional charge. If your shipping amount was under $6 your order will most likely come via USPS FIRST CLASS - this does not get a tracking number. Normally orders over $6 will come either USPS PRIORITY MAIL & a tracking number is sent to your email, please check for it. If you see several items you want in my store, you can order them & pay, then I will combine shipping & evaluate per order and sometimes refund you via paypal based on the actual cost to your location. If you want to contact me in advance for large orders I are happy to estimate it for you. As mentioned above different types of items ship in different types of packaging - multiple item purchases are not always able to ship in the same container - sometimes it will come in 2 packages. If your shipping amount paid allows I will always try to send your order via Priority or UPS so it can be tracked. I have had so many requests for international orders that I have decided to try it again. If you would like something shipped to you outside of the United States please send me a convo with what you would like to order and your address so I can research your shipping cost - I will post a custom order for you with the appropriate shipping to your country. Thanks so much. I do ask that you make an order of at least $75 - The shipping method I use is USPS Priority Mail International and it can be expensive depending on the weight of your purchase and where it is going. I have had problems with items going USPS First Class getting lost in transit so I prefer a quicker method that we both can track. You will receive the tracking number when it ships. As always if you have a question about shipping or prefer a certain shipping method just ask me, I can figure out the shipping charges before you order. translate into current sizes correctly. If in doubt measure an item that you currently own & compare to the online item. PLEASE ask me questions before you order - Vintage items are sold as is & I do not take returns or exchanges. ADULT - These are regular cut adult shirts that are not fitted in the waist or shoulders. GIRLY - These are a more fitted shirt style with a tapered waist & narrower shoulders. KIDS - These will be better described in each item, sometimes I have infant (6, 12, 18 month) toddler (2T, 3T, 4T) youth (XS, S, M). Sorry but I am no longer able to offer products on CONSIGNMENT but I do WHOLESALE letterpress goods only - See Wholesale for more info or email julie [!at] pioneer-house.com. I also offer Etsy Wholesale - look for my line sheet if you have a shop & want to resell my wares. I do not wholesale any vintage items.